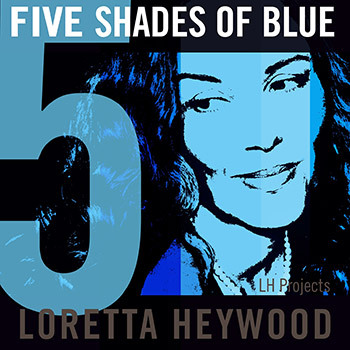 After a two decade-long musical hiatus, Loretta Heywood is back on the music circuit with her brand new EP, 5 Shades of Blue, which was taken from her first series of recordings, entitled The Boy Across The Road. Loretta also comes with a new band in tow, named Five Shades. 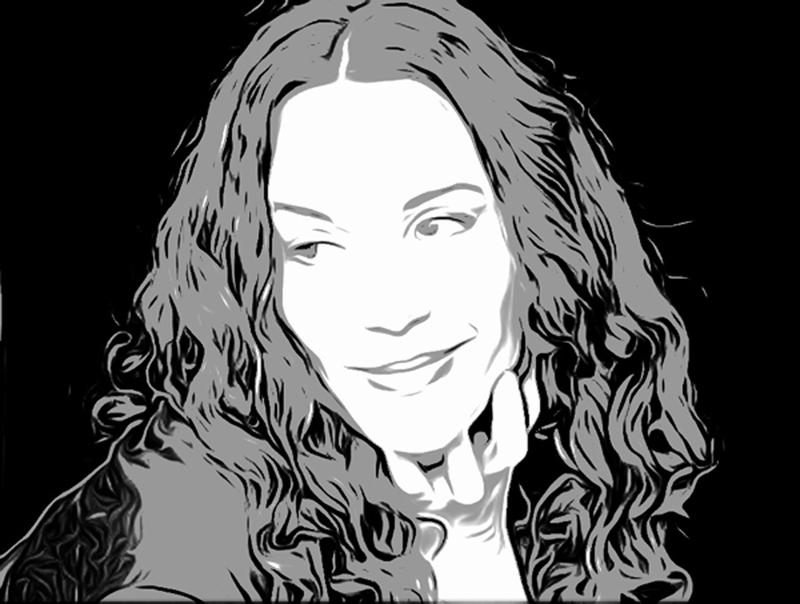 The singer-songwriter, also a former vocalist with Bomb the Bass, hit the charts back in the early 1990s with the hauntingly emotive track, Winter in July, which reached the top five in the National UK Charts. Time has passed so quickly that it is almost as if Loretta popped next door for a while as the sultry chanteuse, only to return 18 years later a worldly, more spiritual individual, bringing with her new life experiences to share and even with academic letters after her name. Loretta’s new songs mirror a perceived dichotomy of the development from girlhood into womanhood, bringing with them a sense of maturity and the impression that she has been on a life-changing journey of some kind, which indeed she has. Yet she still manages to maintain her youthful, openly honest and lovelorn innate qualities that many a young female has experienced or indeed for that matter, anyone with an ability to love. In this exclusive and candid interview, Loretta reveals just what she has been up to over the past 18 years, as well as opening up for the first time about her career, whilst also providing us with an insight into her own particular philosophy on life. It should then become clearer how Loretta’s choices and pathways in life have inspired her to create such evocative music and lyrics. BN: Loretta, it’s really great to see you back on the circuit again. Can you briefly tell us where you have been and what you have been doing in your absence from the music charts? LH: Hmm… how long do you have! Well yes, it’s been a long time and I feel as if I’ve been around the world and back several times over! (Laughs) I took a break from music as I was no longer satisfied with the direction my music was going and so rather than spend my time being disappointed or even becoming disillusioned, I just happened to be fortunate enough that the opportunity to study Ayurveda came about at around the same time. BN: And now you even have letters after your name! You’ve been practicing Yoga for many years now. Is Ayurveda something you have always been interested in and did it follow on as a natural pathway from your practice of Yoga? LH: Yes, I’m now a fully qualified Ayurveda Therapist! Yoga and Ayurveda were – and still are – philosophies that have always interested me. Yoga for one, as you know, was something that I was already practising, so yes, I guess the study of Ayurveda was a natural progression. BN: What, in a nutshell, does your practice of Ayurveda entail? LH: Ayurveda is a healing modality that looks at people’s lives from a totally holistic point of view. It combines massage therapies, healing, dietary and lifestyle advice and the further I studied the more I was hooked. I work with Modern Ayurvedic Programmes – or “MAP” – these are programmes that really look at the emotional health of people, as I believe it is from here that most problems derive, as the mind can rule most things: hormones, metabolism, digestion and of course our own place in this world is seen by our minds – we are our own witnesses and teachers… so we design someone’s MAP to health. BN: From living, consuming and breathing nothing but music for most of your life, it must have been strange to suddenly allow another unrelated pastime into your life to take over. Did you miss making music at that point, or did it all become a distant memory? BN: It’s always interesting finding out where artists go during a hiatus. How then, for you, did your own change of pathway come about? LH: Well, I was doing Yoga from around 1992 in Ladbroke Grove, with a fantastic teacher named Faustomaria Dorelli and I was also seeing an Ayurvedic doctor, Dr Donn Brennan through Maharishi Ayurveda. The purpose for me was to try to find how to cope with my feelings of anxiety and depression that I was experiencing at that time. I started to practice TM (Transcendental Meditation), as recommended by a friend and singer, Billy Ray Martin, who mentioned how it had helped her with her live performances. I was desperate to find answers in my life and so my first step was through TM and Yoga, which of course, is a sister-science with Ayurveda. Ayurveda was the only subject I was interested in at that point in my life, alongside cooking! I would read books, see doctors and so forth and I found it fascinating, so it made sense to study Ayurveda, as I knew I had to find another path to survive in life. I wasn’t making enough money to live off music anymore, the music scene was going through some crazy changes – meaning there were times of feast or famine – and it also wasn’t making me happy feeling a lack of direction or purpose. I was dyslexic, with no admin skills, so actually I had little choice! I started with massage, the rest is history and 13 years on, still with some of my own clients, I still love it find it deeply inspiring. BN: So what or who is it that has inspired or prompted your decision to lure you into a comeback with your music? LH: I had never really left music totally – it was always in my heart and I always knew at some point that I’d revisit my songs and try again… the pieces I wrote are really like the pieces of my life’s puzzle, if you like, but also part of the bigger picture and plan. I had also met with Andy Mitchell (The Boy Across the Road), in 2002, and had decided to record ten of my best songs on one album, as I had worked with so many producers and developed so many styles. I have recorded with so many fantastic producers over the years, but never managed to make my sound gel with all my songs, so it took the real boy across the road, Andy, to bring it altogether, hence the title! We literally put it together in my front room and because he only lived across the road, it came together so easily. We created a small acoustic album that various projects have now come from. So I recorded the seeds to my album, The Boy Across the Road, tried to release it and after maybe one year of trying to do this in tandem with studying Ayurveda, working to pay for studies, and so forth, my life was going in circles again. So I put the album on the shelf and focused on what I really was meant to do be doing at that time – working and completing my studies. Over the years, I had stayed in contact with some of the guys I had worked with before – Bugz in the Attic, Daz-I-Kue, etc. and then someone had heard something that I recorded with them and asked to remix one of my songs, Little Angel, and I suppose that’s what really marked my return to music. BN: What an interesting route to take to realise a dream, but then again, it’s not all just about the destination! Your songs seem to inspire women of all ages, from all walks of life. For some of us, it might re-awaken that youthful and simplified approach we used to take to love, life and relationships and perhaps reminds us of how far we’ve come and how we used to be. How important do you feel it is to stay true to yourself and young at heart? LH: Well that’s simple. It is the only important thing we need to remember to do – stay young at heart. BN: Wandering through your website (http://www.lorettaheywood.com/music) might be akin to discovering a little treasure trove of goodies that emulate the Russian Doll Effect – open one and discover even more inside! You have, as you say, collaborated with some renowned producers in the industry, for instance; Tim Simenon and Guy Sigsworth from ‘Bomb the Bass,’ ‘Bugz in the Attic,’ Daz-i-Kue and even David Arnold, with whom you co-wrote the unforgettably powerful and evocative track ‘Suspicious Minds’ and who is now famed for scoring multiple Bond films. How did you initially hook up with Andy Mitchell and Will Worsley, who co-produced some of your new material with you, particularly as Andy seems to come from a totally different background, in terms of genre? LH: It’s funny – my life is like a Russian doll – each person I know and work with seems to sprout from a doll or seed… It seems that everything is connected from my past or someone in it… and then it leads to something else… a hidden treasure. Really, sometimes I just smile at that magic – how everything is connected through simply following your heart and using your wisdom and intuition and then of course, a bit of luck, I guess. Nothing seems to have come through pre-determined decisions and goals… even though I have goals and dreams, the ones that happen best are the ones that just happen through simple connections – with ease – like meeting someone who knows someone… so yes, luck I guess and timing… and persistence! Andy was new to music when I met him. He had never produced anything but his own material. Between the two of us, I think we started to realise Andy’s potential and from that seed, my album has blossomed! Rock was always his style and his own music is pretty rock-based! Actually, it’s a bit like a game of snakes and ladders… one step leads to another and that determines the result. BN: Your powerful vocals could certainly carry a rock tune. Would you ever be looking to produce any rock tracks in the not-too-distant future? LH: Wow, talk about intuition – it’s interesting that you picked up on that! 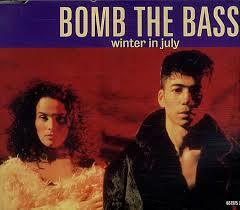 So another story with my Bomb the Bass track, Winter in July… is that it is now on a rock album! It’s being sung by Jonathan Cohen, from the band, Johnny Wore Black. It’s amazing how this has happened, again actually – it was another story of chance and snakes and ladders. So this year it’s going on his album and it’s an interesting direction in which to take Winter in July, which strangely enough, seems quite at home as a rock ballad! It’ll also be featured on Johnny’s website www.johnnyyworeblack.com, so it’s all very exciting. Then there’s also my new band, Five Shades, which will also carry rock influences from Skip McDonald (aka Little Axe), who has had a lot of influence on our 5 Shades of Blue album, in terms of its production and mixes. BN: ‘Winter in July’ is, without a doubt, one of my favourite tracks of all time. You are a truly gifted lyricist, a deep thinker yet honest and open with your feelings too, I might add. How do you find your inspiration and courage to lay your thoughts and feelings down so barely? LH: I have no idea… I feel, I write… no pre-decision of what I will write, but for me, maybe being dyslexic and having difficulty in finding words easily, it takes a lot of hard work to make it sound right lyrically. I don’t think I’m a natural songwriter, as it really takes a lot for me to be inspired enough to write… I know some singers who can write three albums in a year! For me, it just takes longer. I wear my heart on my sleeve and just sing whatever’s in my heart, so that must be it. I have to write what I feel, but I also feel removed once I have written them and sung the songs, if that makes sense. I think there was a quote somewhere by Anaïs Nin that said, “The role of a writer is not to say what we all can say, but what we are unable to say.” Two Broken Hearts was a painful song to write, as was Butterfly. But once I write them and go through the experience of a broken heart in love, I can somehow detach and I no longer feel it as intensely, but I hope that other people will recognise and feel it and that it helps them in their own journey through love and life’s experiences. I guess songs can be cathartic and healing and what makes me smile now is how I’m actually in a healing profession! It’s amazing that I still get email today from people who loved Winter in July, saying that it really helped them get through a difficult period in their life. I guess that is the reason I do what I do… to heal. BN: One notable remix for your new single, ‘This Boy That Girl’ has been put together by Jasiu Sigsworth, son of Guy Sigsworth from your previous ‘Bomb the Bass’ days, as well as a whole host of new and varied remixes that can also be found on your SoundCloud page. Are there any plans for future collaborations with any of your former fellow band mates? LH: Yes I hope so… Tim Simenon lives in Vienna now, but we speak from time to time and I’m sure we will do something one day maybe. As far as working again with Guy Sigsworth, I have songs I have written with him that are not yet recorded, but we do plan to as soon as our schedules allow. Also I am working with Skip McDonald who also worked with Bomb the Bass back in the day – that’s how we met, 22 years ago. I have recorded 5 shades of Blue with him and Guy may work with us also on our subsequent album, Shades of Red. This would give us the opportunity to all get back together again in a work capacity and that does make me happy. BN: Chris Franck’s Extended Mix of ‘This Boy That Girl’ is one of my favourites, among others, although if you want to talk about tracks that really get your feet going, your mix of ‘Keep Your Head To The Sky’ which can also be found on your website (under “LH projects”), is spiritually uplifting. It conjures up such wonderful images of summer days and nights in the city and a carries a general feel good factor. I have had this track on my phone for ages. It would make such a wonderful summer anthem, particularly during Carnival time. Please tell me it’s going to be released for the summer! LH: Well Daz had released it on a co-op compilation, so I didn’t think to re-record it, or it didn’t fit my album… but I am releasing it on an LH Projects album – a compilation of all my featured songs. You’re right though, it is one of my favourite songs also! I look forward to doing this live, especially. Funnily enough, I just spoke to Daz at Carnival this summer and he’s been working on an RnB mix of This Boy That Girl, which should also be really interesting! BN: Moving back toward spirituality, you have also included the beautiful meditative Sri Adi Shankara Sanskrit chant, ‘Bhavanyastakam.’ This particular track is also reminiscent of Deva Premal’s work and instantly brings to mind similar devotional songs by former Japan frontman, David Sylvian. Could this also be a direction you would like to pursue in the future? Could you tell us more about the meaning behind the chant and what that meaning holds for you personally? LH: Yes, Bhavanyastakam and others is where I see myself in the not to distant future, maybe with 5 Shades of White. BN: There’s a Blue, Red and a White? You wouldn’t by any chance be a fan of the film director Krysztof Kieslovski, would you? LH: Absolutely! One has to pay homage where one can… (Laughs) White is also very spiritual… and is known as one of the ‘higher shades’ in healing terms. But I have always wanted to record an album of chants – there’s just not been the time or opportunity to do so, but it is very much part of what I do now with Ayurveda and Bhakti Yoga. BN: What is Bhakti Yoga and how does it differ from other forms of Yoga? The lyrics are a prayer to Mother Divine for protection, but when I first fell in love with the chant I had no idea what it was about. For me initially it was the essence of the song, the melody and the voice I heard that really inspired me. So that is the basis for future chants and prayers: if the melody resonates with my heart, I want to sing it. The spirituality aspect of it for me was that singing it made me feel more divinely protected, by something higher and beyond me – a life force or God – that, when sung with honesty and the right intention, I think it has a great impact on our karma. I believe the force of nature protects when the intention is right and we are living our dharma (purpose) that creates our karma (outcome). BN: What a beautiful philosophy on life. Equipping oneself with a means to get through certain trials in one’s life is certainly a feat in itself, let alone the ability to do so as a bonus. Armed with these new abilities, how different, since your comeback, have you found the workings of the music industry to be and how do you feel you have adapted? BN: How different or developed would you say Loretta Heywood has become as an artist and individual over the years? What key things have your experiences taught you? LH: As an artist, I think I’ve developed as I’ve gone along and also grown naturally with changes in music. Whom I work with kind of determines the style of music as well and I am open to any sound that I feel has some kind of resonance with me. So the music has developed naturally with the people I work with and am drawn to, but the essence – my vocals and style – remain the same. It feels more natural now and I don’t feel the need to emulate anyone else, so people can either like it or not like it… it’s a matter of preference. I just do what I do and feel so blessed to have worked with some great creative artists and producers who have innovative and different styles that have given my songs a new slant. Winter in July is the perfect combination of a normal sing-along melody combined with dark, heavy Leftfield-style backing. That was what I wanted from the start – a darker side to music that is different in its own right, but that also complements my own vocal style – the dark/light and yin/yang. I am not and never really have been your run-of-the-mill pop singer, but I do work well when instruments are stripped down to the bare bones… acoustic guitar or any other similar single instrument. As a person, I would hope that I’ve changed and grown in the last 22 years! Life has certainly dealt a few tough situations, but I’ve survived! That alone was a great teacher and a confidence builder, but really I learned not to care what the rules are, to go with your feelings, believe in whatever you do, even if it might not seem the right way. And stick by your ideals and dreams until you are satisfied – reassessing as you go along… you only have one life, you might as well live it! Life becomes what it is through choice not destiny, but choice becomes and creates your destiny – free will, if you like – we affect our karma from moment to moment. It may seem like a gamble; it may or not work… there are no promises or guarantees other than what you choose to work with or walk away from… so you just have to be happy with what you decide and be ready for whatever the outcome… detachment with attachment without expectation. Yes, that could be a lifelong lesson for us all, I think. BN: It would be great to remember all these philosophies when the crunch really comes and we need to reflect on what we have learned along the way. There certainly is power in both hindsight and foresight. If you had three important points to pass on to aspiring artists, based on your own experiences, what would they be? LH: Follow your heart to create your own life path; break the rules and then make new ones; be honest and true to everyone and everything and have no regrets. Also, don’t care about what people say or think; practice the art of pretending – you know, like it doesn’t matter – and just move on. Sorry, had to change that to five things, but I’m sure there are many more! BN: Loretta, it has been an absolute pleasure talking with you. Thank you for taking time out of your busy schedule to share with all of us what you have been up to, as well as some of your personal thoughts and beautiful philosophies on life. Wishing you and your new band Five Shades every success with subsequent singles and albums. LH: Thank you, it’s been a pleasure! Loretta will be making her first live London debut with her band Five Shades on Friday, March 21st 2014 at The Elgin, Notting Hill in west London. Five Shades are L to R: Loretta Heywood (vocals); Skip (Little Axe) McDonald (guitar); Humphrey Couchman (cello); Mike Timothy (keyboards, piano); Andy Mitchell (additional vocals and guitar), with other guests David Ruffy and Matt Smyth. where you can also contact her to get on her mailing list for the latest updates and newsletters. Wonderful and insightful interview Brucella! Thank you for introducing me to Loretta Heyworth and her beautiful music. Love ‘Butterfly’ and ‘Two Broken Hearts’ especially. I wasn’t able to watch the video ‘Winter in July’ posted as it is not available to view in the US. I was able to listen to it via her official Website though. WOW!! Love the analogy of the Russian doll too. Well done! Thank you so much for your lovely comments, Simran, so glad you enjoyed the interview! She really has written some beautiful songs and I hope that she finds a new audience through her come back… She has had quite a lot if radio play already, over the past few days! Thanks again! You are so welcome! Glad you enjoy her music too!